Sea View Cottage is located only a few feet from the water's edge, directly by the ocean and with breathtaking views of the sea and coastline of West-Cork. This 'cottage' is newly refurbished and furnished to the highest standards, it has its own private entrance with ample parking. The nearest beach is only a few meters from the house, 2 min walk. All rooms are located on the same floor level, 4 bedrooms, 2 well equiped bathrooms, a large kitchen fully equipped to a very high standard and the sitting room area has an open fire and comfortable soft furnishings. A double sliding door leads from there to a patio area overlooking the sea. Clonakilty, the nearest town, has some very good shops, execellent restaurants and bars with traditional music. The house is furnished to an extremely high standard with great care and attention to detail. The perfect holiday getaway. A home away from home. 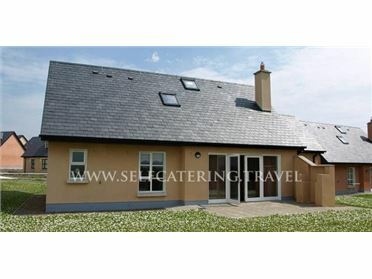 Ballinglanna Holiday Village is located approx 6 km outside of Clonakilty Town. Clonakilty is a picturesque seaside town situated in the heart of West Cork. It is a Town for all Seasons. It has a metropolitan, carnivalesque feel, lots of gourmet food, good shopping and street life awaits. Clonakilty has a well-deserved reputation for some of the most sandy beachs in Ireland such as Inchydoney, Long Strand, Red Strand, the Warren and Owenahincha. Interesting coves and inlets abound the West Cork coastline around Clonakilty, too numerous to name but finding just some of them is all part of the magic of this picturesques coastal location. For families, walkers, surfers and bathers, there is something for everyone to enjoy. It is a spectacular holiday destination and base from which to tour West Cork. Cobh, Kinsale, Schull, Baltimore, Skibbereen and Bantry, are all within in driving distance. The Ring of Kerry, Sheeps Head and Beara Peninsulas all make fabulous day trips.